I enjoy helping people achieve a higher level of health by providing personalized and precise dental therapies and dental expertise for medically complex and geriatric patients. Over the past 17 years, I have gained experience in many aspects of dentistry, from simple preventive care to complex restorative procedures. I am proud to offer a high standard of care whether I am placing a filling or creating a new, beautiful smile with a cosmetic dental makeover. I graduated with a Bachelor of Dental Surgery degree from the Tamilnadu Medical University in Madras, India in 1996. After moving to the United States, I graduated as an advanced-standing student with a Doctorate of Dental Medicine from the School of Dental Medicine at the University of Pennsylvania with double honors. In addition, while at Penn, I did an honors program in pediatric dentistry at Children’s Hospital of Philadelphia. I am involved in continuing education monthly to give my patients the highest standard of care. I attained an Associateship from the International Association of Orthodontics, completed an Implant Fellowship from the International Congress of Oral Implantologists (ICOI), received my Certificate in Soft and Hard Tissue Grafting from the Medical University of South Carolina, and am currently on the Fellowship track for the Academy of General Dentistry and the Academy of Oral Medicine. I am among a select group of dentists certified by the Pennsylvania State Board of Dentistry for Anesthesia, Moderate Sedation. With this distinction, I am certified to perform Conscious IV Sedation Dentistry. I belong to the American Dental Society of Anesthesiology. In addition to my work with Dr. Foore at The Gentle Dentist, I am also a Clinical Associate in the Department of Oral Medicine at the University of Pennsylvania. In my free time, I love spending time with my two daughters and my husband. My daughters and I enjoy making organic household and lotion products, and when I get a quiet moment, I love to read. 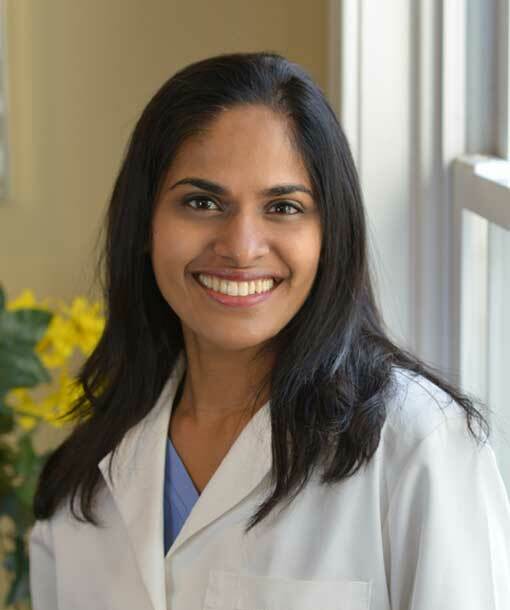 Read reviews about Dr. Geetha Srinivasan at HealthGrades.